There has been much debate over shaving your dog’s coat during the hot summer months. After doing some research of our own, the answer to the great shave debate is…it really depends! No matter what type of coat, it is important to consistently keep your dog brushed and bathed in order to maintain a healthy coat that will protect your dog’s skin from the harsh sun. For dogs with single layer coats, shaving might be a great option to keep your dog cool. For dogs with double layer coats, summer grooming is slightly more complicated. Not sure if your dog has a double coat? See if his or her breed made the list. Natural Adaptation. A properly maintained double coat can insulate your pet from heat. When double-coated breeds undergo normal seasonal shedding, which is triggered by longer daylight hours, they drop much of their undercoat. 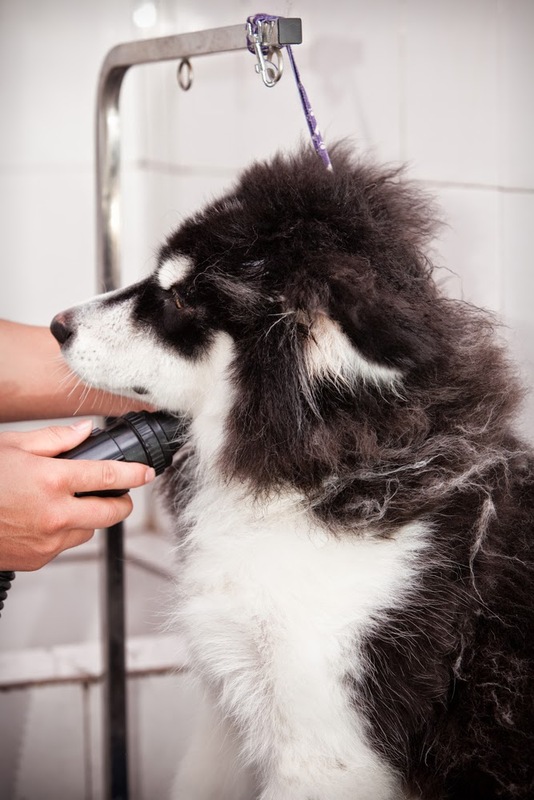 If this shedding coat is properly maintained and removed by brushing, bathing, and drying, what is left is a small to moderate amount of undercoat and the long, glossy hairs. This longer but reduced coat, helps to defend the pet from hot air, overexposure to the sun, and even from biting insects. Natural Protection. A pet’s coat protects against sunburn and skin cancer. Thinner coats, or white or light-colored coats are especially vulnerable to sun damage. You dog’s coat helps prevent bug bites, and as you know bugs are quite common in the summer! The bites can be quite painful and may potentially cause allergic reactions, hot spots and irritation. Always exceptions. According to the ASPCA, there are better alternatives to shaving, such as trimming and brushing your pet’s coat, especially during warm weather, but of course, there are also exceptions. If your dog has hot spots, you might need to shave the area to help it dry out and heal properly. If your dog’s coat is full of mats, you may also want a groomer to shave the coat so to prevent irritations. Your vet may also recommend shaving to help treat medical conditions of the skin. Dogs with long hair around their back end, may also benefit from a trim back there to keep the area clean. Ultimately, it is up to you to decide what is best for your dog. The more you know about your pet’s coat, the better you are able to give them the best care. Last but not least, don’t be afraid to ask your groomer if you have any questions on how to properly trim your pet to beat the heat! They are the experts, and will be sure to give you the necessary information to make the best decision possible.